It is that time of year when the team at COMC packs their bags and heads to the largest card show in the nation: The National Sports Collectors Convention! This particular year, we are packing some slightly heavier bags than normal thanks to your help in filling up The Vault. However, we are also bringing along a few extra goodies as well. This is our first time in the Corporate Area! You will find us at booth 850 in between Panini and PSA. You will have an opportunity to see Tim, Julia, Geoff, Steve, Jim, me, and other members of our Team. After you have met us, we have a few surprises. For the first time ever, we will be doing On-Site Processing at The National! You heard us right: bring your cards to us while we are at the show, and we will process your cards right there at the convention. Note: Due dates will be based off of when items are submitted at The National instead of waiting until we receive them back at the office. Beckett Collectible Cards- come by the booth for a chance to get access to a unique collectible card featuring COMC! If you have never consigned with us, we will process your first item for free while you wait! Submit up to 200 cards at $0.50 per card to The Vault, and we will have the cards processed and on the site as soon as possible, for sure in One Day! Submit any number of cards with our One Day, One Week, or One Month services. Not only will we pay to ship your items back to Redmond for you, we will also start processing your items at the National so that your due dates will be based on when you drop off your items instead of when they get back to our office. If you would like any of your items graded by Beckett and than returned to your COMC account, you can drop them off with us, and we will put them in your COMC account within 24 hours for FREE. Once they are in your account the only thing you will be able to do with them is to select a grading service. The grading fees start at $12 for one month service. To celebrate our 7th National and our 6th anniversary, we are offering a $70 Flat Rate Special for a 660ct box. You may also elect to drop these cards off at the National and avoid any shipping costs! These cards will be given out Thursday-Sunday at our booth, so be sure to swing by for your opportunity to collect them! Blowout will be hosting a raffle Thursday-Saturday at 3 pm, and COMC will be there. Not only will you have a chance to win one of the unique Beckett Collectible Cards, but there will be 2 $20 COMC Gift Cards in the raffle each day as well! Don’t miss your chance to have some fun with Tom Fish and earn a chance at some awesome prizes. While we are at the National, Tim and the team are looking forward to speaking with many of our users face to face. If you are at the National and would like an opportunity to sit down with Tim and chat, please email us with the subject line “Time With Tim” and let us know what days you will be at the National. We will work with you to reserve 30 minutes of one-on-one time with Tim. We are especially eager to hear from those of you that run group breaks or box breaks for your customers. We are building some new innovative services that will help you save time and money. Well, there you have it folks. Not only will we be showcasing hundreds of valuable cards from The Vault at this year’s show, but we will also be processing your items right there during the festivities! So come by to say hello to the team, see some beautiful cards, and tell us your thoughts about the site in person. We look forward to seeing many of you there as well as unveiling our newest service in front of one of the world’s most lively group of collectors. This entry was posted in card shows, specials, The Vault. Bookmark the permalink. Or 6 for your 6th anniversary. I promise it will be mostly Bowman Chrome. It won’t be hard labor. Hey guys thanks this will help me with my last shipment I think alot of my stuff is pretty thick I may be better going the other way. Now if I could count out 660 cards that would be a deal? Can I? Hi cardko; because we’re expecting a lot of participation from sellers, we have to stick to these limits: 1 660 count box, or 11.75″ of cards (length of a 660 count box). Thanks! 1 box is fine… I had some numbered stuff I was going to put on Sportlots but at roughly 15 cents per card…I am happy to ship them to COMC! Sounds like a deal. This seemed to ratchet up buying last year also around the start of the NFL as sellers were also looking for deals. Hopefully there will be a black Friday shipping special this year also to generate more sales. Thanks for the deal COMC! Now can we get some info on what is going to happen with the history points and market value/sales history soon as I’m sure it will be tweaked. As we get more feedback from our users, I’m sure we’ll make adjustments and modifications to this. As for Black Friday? I’m sure we’ll have something happening – but, we’re focused on the National show right now. When we recover from that, then we’ll start gearing up for Black Friday and Christmas. Thanks! So we can use 2 smaller boxes (ie 300 count) as long as the card portion of the boxes measure a total of 11.75″ or less? 2 smaller boxes are easier to send in a medium size priority box. Hi Randy; as long as it’s under 11.75″, then you’re good to go. Thanks! You can save money by using a Regional A Priority Mail box. Am I understanding correctly that it does NOT have to be at least 100 cards from the exact same set? It can be a 660 count box of any combination of cards, inserts, etc.? You are correct. These can be cards from any set, sport, ect. When can we begin submissions? The Submission Wizard only allows allows for drop offs. You may begin sending these in a now. Please be sure to note on your paperwork that this order is for the 660 National Special. I still have a voucher left from last Black Friday. Can I use that to pay the $70 for this special? Confirm with our customer service on Monday but there should be nothing to prevent you from doing so. You may user your Black Friday Voucher for this purpose. Please be sure to include this clearly on your paperwork when you send in your submission. When trying to submit the $70 special batch it only gives us the option to drop them off at national. How can we choose to ship them instead? Thanks! That has been fixed. Thanks for pointing it out. Also I assume we can send a regular submission ad the national special in the same flat rate box as long as the 660 count box is clearly marked correct? Yep, that is fine. You can use the submission wizard to tell us everything that you will be including in the package. Last yr, when u guys announced the 5 box deal, I spent weeks going through tens of thousands of cards strictly to fill up as many boxes as I could. Who knows how many hours I spent, litterally morning noon & night. When it was done, I was exhausted. But boy were those weeks fun! Once you guys have the 660 count box from people, does the 6 weeks start from when you guys receive them? Once the submission is in our hands, the clock starts ticking. Nice but i would still like the Grading due date added to the site. I know when i submitted the cards but i would like to know the date they are due back or atleast due for grading. Since i can check Becketts web site. You are welcome to do this. Please be sure to clearly mark which box is for the special on the outside of the box. Are penny sleeves required for the 660 ct submission? 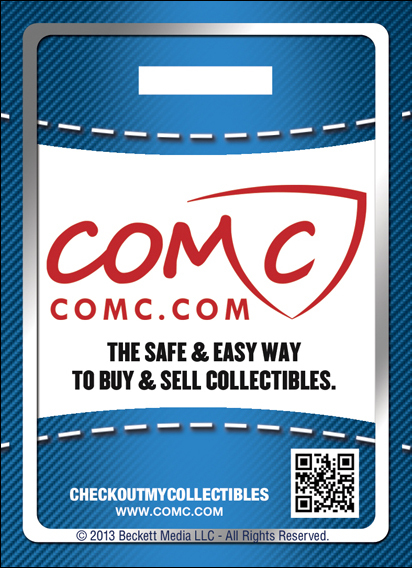 Hi Peter…penny sleeves are recommended for all shipments to COMC, for the protection of your cards during shipment. Thanks!